Object-based audio support and a seemingly endless array of features, streaming, and high tech don't compensate for poor sound quality. Onkyo’s SBT-A500 soundbar is the first model we’ve encountered that supports Dolby Atmos and DTS:X and costs less than $1,000. It’s a slimline model that sits just 2.1-inches high, and it boasts a feature-set that reads like a tech-lover’s wish list. 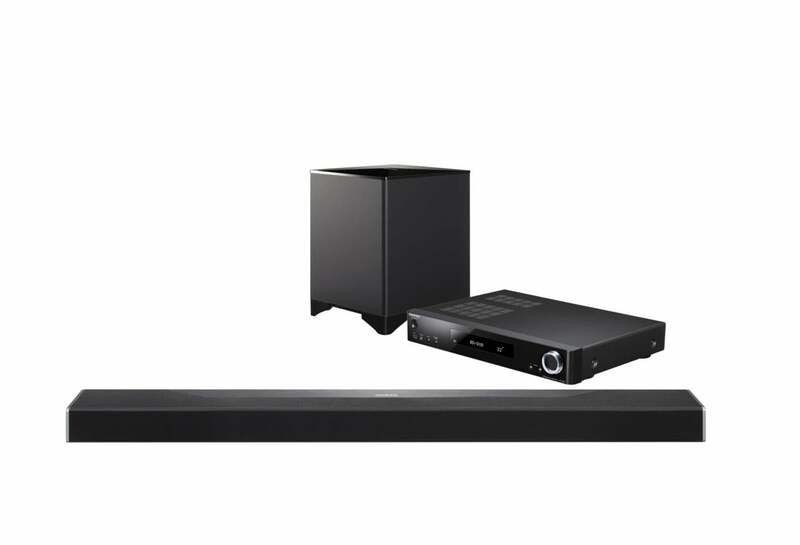 Part of the reason why Onkyo is able to keep the soundbar thin and the features set rich is because the SBT-A500 consists of a passive soundbar, a wireless active subwoofer, and a stand-alone A/V receiver. No other soundbar in our lineup comes with a separate AV receiver. Dual-band 2.4/5GHz Wi-Fi is standard, and you get a physical ethernet port, too. Looking to stream music? Take your pick of Wi-Fi, ethernet, Bluetooth, DTS Play-Fi, Apple AirPlay, Google Chromecast, and FireConnect. But you might have to wait for firmware updates to realize FireConnect, DTS Play-Fi, and Chromecast support. Not familiar with FireConnect? It’s a new media-streaming technology from Blackfire Research that’s been picking up lots of design wins lately. Like DTS Play-Fi, FireConnect will deliver wireless whole-home audio (and video!) while giving you the freedom to choose from any manufacturer that makes FireConnect-compatible devices. Through Onkyo’s remote control app, you’ll also have access to TuneIn, Tidal, and Pandora, among other music-streaming services. Spotify Connect lets subscribers stream directly from the Spotify application. Onkyo even put an old-school FM tuner in the chassis. The included A/V receiver comes in the familiar 19-inch form factor, but you won’t need to fool with different types of connections as you do with most A/V receivers. 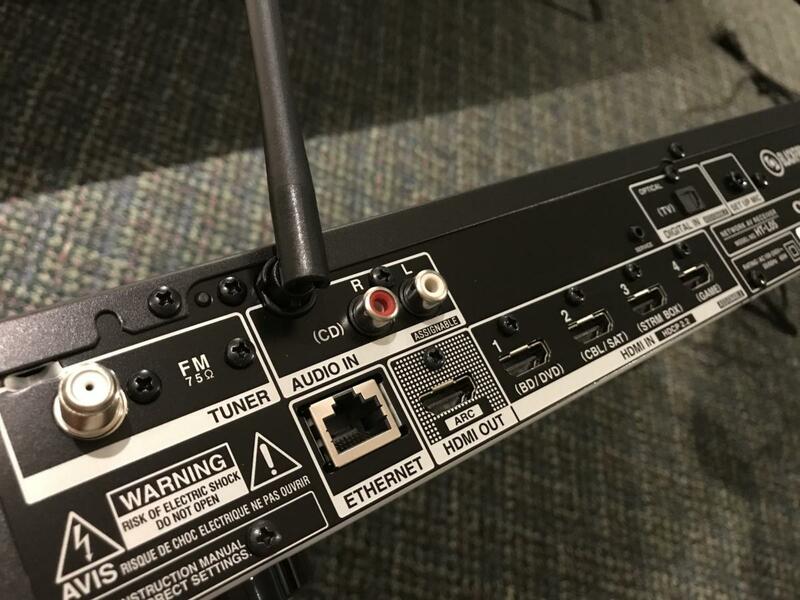 You connect your conventional analog and digital sources to the receiver, and then a single cable goes from the receiver to the soundbar. The subwoofer is wireless (apart from its power cord, that is). 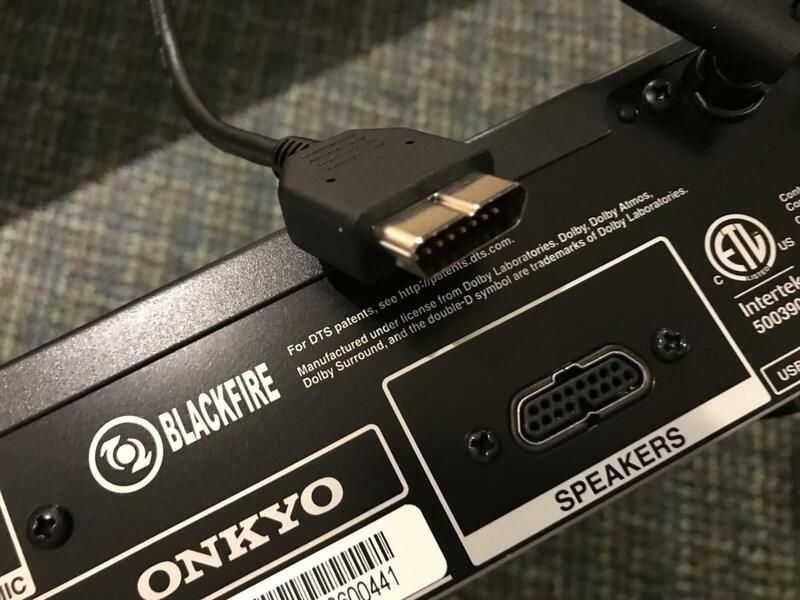 The Onkyo doesn’t use traditional speaker cables to connect the AVR to the soundbar. It uses a single connection cable. The Onkyo is a 3.1.2-channel setup, which means that the soundbar has discrete left, center, and right channels, a subwoofer, and two height-effects drivers. Those height drivers are technically called Dolby Atmos speakers because they provide the discrete up-firing height channels required for Dolby Atmos and DTS:X object-based audio reproduction. These two Dolby Atmos speakers work their magic by bouncing sound off the ceiling and down to your listening position, and they’ll only work on flat, reflective ceilings that are between 7- and 14-feet high. Don’t try height-effects speakers if you have a cathedral or angled ceiling—it just won’t work. The Onkyo’s A/V receiver is equipped with four HDMI inputs that support HDR and HDCP 2.2, one HDMI out with ARC, a Toslink input, analog stereo inputs, ethernet, and an FM antenna. The Onkyo’s slimline receiver has four assignable HDMI 2.0a inputs with HDCP 2.2 copy protection support. The receiver will upscale any 1080p source to 4K Ultra HD. This feature loses a bit of its luster, however, when you consider that most 4K UHD TVs come with upscaling options of their own. Toslink digital optical and analog stereo round out your input options. 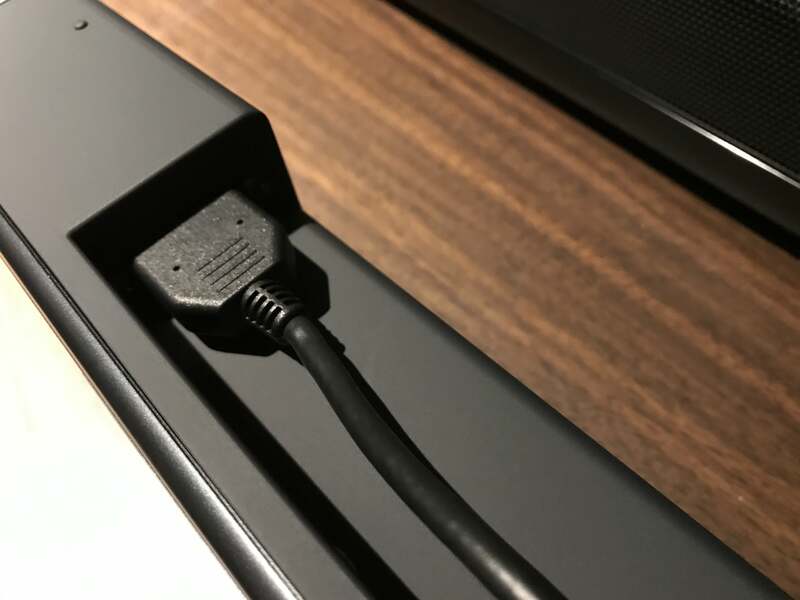 There’s a single HDMI output with ARC (Audio Return Channel), which allows compatible TVs to send audio back to the Onkyo over the same HDMI cable. 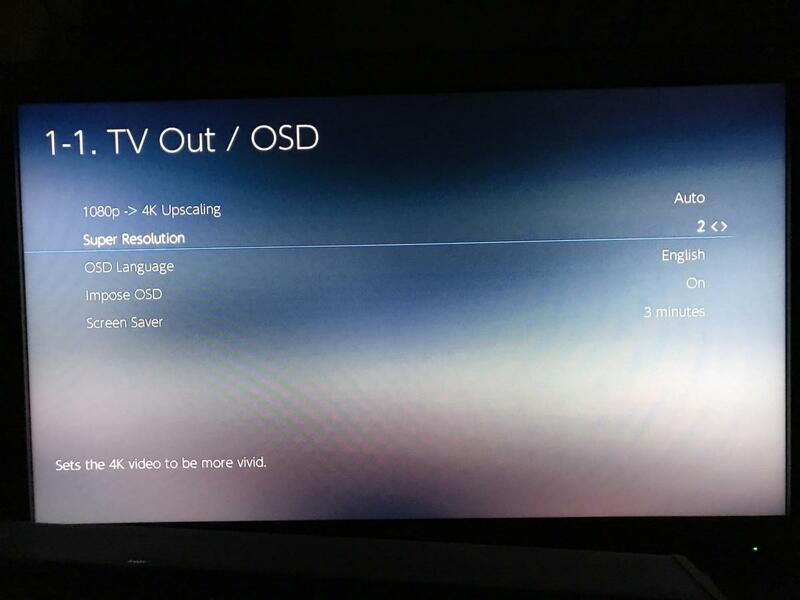 As if that feature set wasn’t long enough, the Onkyo SBT-A500 also includes room-correction technology. Onkyo uses its AccuEQ room correction software, which will automatically calibrate the soundbar and sub and attempts to compensate for any sonic anomalies it detects in your room. The Onkyo’s connection cable fits neatly into the rear of the soundbar. Connecting the Onkyo receiver, soundbar, and wireless sub was a piece of cake. The sub paired instantly. Start to finish it took about three minutes to run Onkyo’s AccuEQ room calibration. 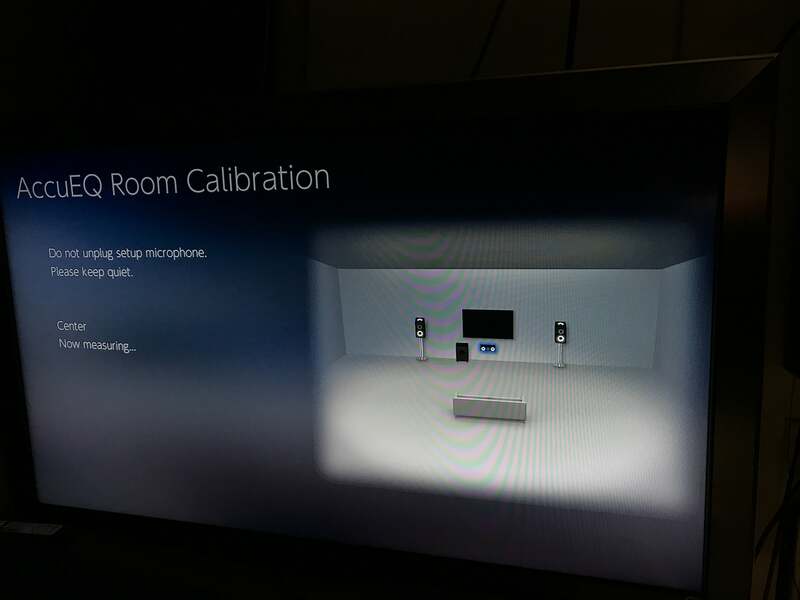 I placed the calibration microphone on a tripod at ear-level at the primary listening position. If you don’t have a tripod, you can hold the microphone—just keep the microphone at arm’s length from your body. AccuEQ room correction does all the heavy lifting, calculating speaker distances and volume levels automatically. Onkyo’s AccuEQ automatically measures the distance and volume level of each driver. The Onkyo SBT-A500 includes a good remote that’s well laid out, putting everything you need at your fingertips. 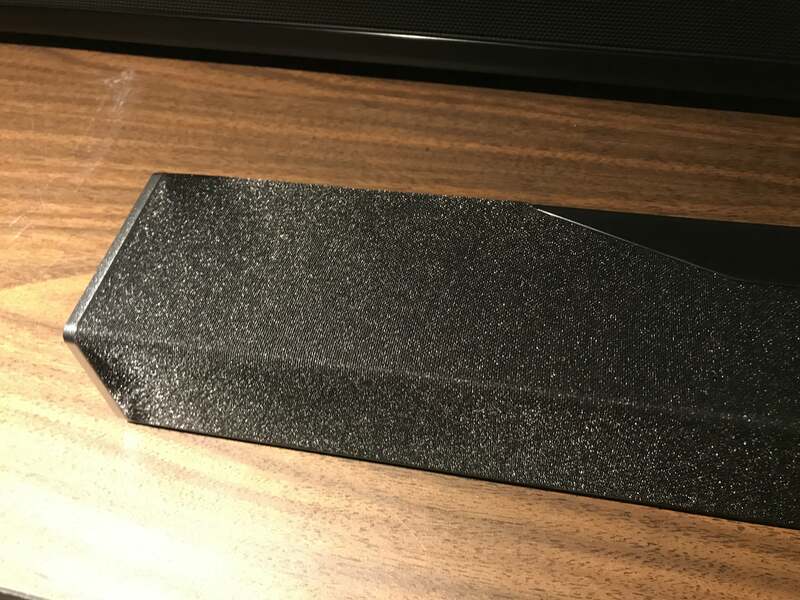 It’s vastly superior to the lackluster remotes that come with most of the other soundbars I’ve reviewed. I loved it. It’s a great option in households where you need an alternative to an iOS or Andriod app. A beautiful on-screen display adds a real touch of class. Paired with the elegant Tron-like glow that emanates from the receiver’s volume control and its easily-readable display, I was anticipating a real treat. The Onkyo has a beautiful and slick on-screen display. I was stunned when I fired up Rogue One: A Star Wars Story on Blu-ray to start my round of testing. The bottom end sounded bloated. The mid-range was muffled. Dialog came across so dull that it sounded as if the actors were talking with their hands in front of their mouths. This was not what I was expecting from this setup. Let me relate some examples. In Rogue One, Chapter 2: “Unfinished Business,” when Galen Erso and Director Orson Krennic are speaking to each other in the open fields on Lah’mu, I felt as though I wanted to open an imaginary window so I could hear their lines more clearly. Pressing the Onkyo’s dialog-enhancement button helped, but then the timbre didn’t sound right. And it wasn’t just dialog. Cymbals, horns, and brass instruments didn’t have their typical luster. Dynamics were flat, too. When the rebel alliance members free Jyn Erso from the imperial prison transport, the explosion that opens the transport’s door lacked the chest-thumping impact I expected to hear and feel. Blasters sounded reserved, too. Unlike most soundbars, the Onkyo has a cloth covering on top. It hides the upfiring speakers on the left and right that bounce sound off the ceiling while playing Dolby Atmos and DTS:X soundtracks. I tried several sound modes to see if I could get some sort of relief. Dolby Surround sounded the worst in my room, while DTS:Neural X was the best. But the only way I could coax the SBT-A500 to produce more natural sound was to put it into plain old stereo mode. I did some back-and-forth testing, and none of the movie modes sounded better than stereo. When the young Jyn Erso is hiding in the underground safe-house, for example, the thunderstorm outside sounded cleaner and better-defined in stereo. It sounded muffled with the surround modes. I have a dedicated Dolby Atmos 7.2.4 home theater setup with discrete in-ceiling speakers for height effects. I’ve also used Dolby Atmos speakers, including the MartinLogan Motion AFX, which I reviewed earlier this year. If you want reference-level object-based audio performance, the Onkyo isn’t the right fit. If you’re just looking to experience height effects, on the other hand, the Onkyo gets at least a passing grade. I fired up the 4K UltraHD Blu-ray version of X-Men Apocalypse via an Oppo UDP-203 Ultra HD Blu-ray player. At about the 10-minute, 15-second mark, Scott Summers (aka Cyclops) enters a rest room in a failed attempt to control his optic force beams. As they shred the restroom wall and ceiling, debris falls all around. The Onkyo did a very respectable job of throwing a large soundstage and creating the sensation that debris was falling from the ceiling, but it lacked the refinement I typically hear in this demo clip. Sounds were fuzzier, less precise, and lacked detail. 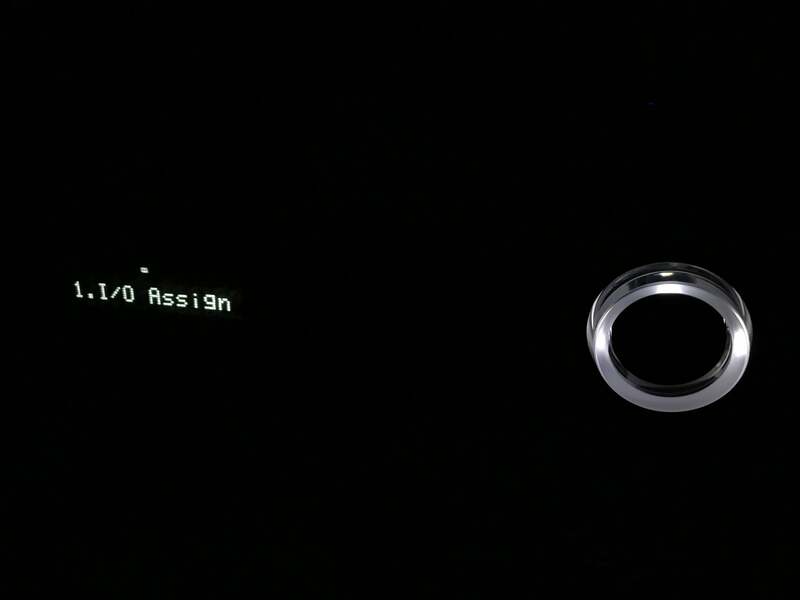 I then fired up the DTS:X 2016 Demo Disc on Blu-ray, which has several DTS:X movie clips and music tracks. (Unfortunately, it’s not commercially available.) From that disc, I played the airplane scene from the Vin Diesel film The Last Witch Hunter. The Onkyo did an admirable job of opening up the front soundstage, but it just couldn’t deliver the acoustic height effects with any degree of precision or detail. The band Imagine Dragons has a special DTS:X mix of “I bet my life.” It’s mesmerizing on the right system. When the chorus kicks in, it positively surrounds you. It’s like the walls of your room disappear. Alas, that wasn’t the experience I got from the SBT-A500. Essentially, Onkyo provides a taste of Dolby Atmos and DTS:X object-based audio, but it doesn’t bring out the best of what those codecs are capable of. Not by a long shot. The Tron-like glow of the AVR’s volume knob is beautiful in a dark room. Onkyo’s SBT-A500 soundbar is a classic case of trying to do too much for too little. On paper, there’s no question that the SBT-A500 is an extremely attractive, feature-rich package. With networking and streaming options galore, a wireless sub, Dolby Atmos and DTS:X audio support, an A/V receiver, and built-in room correction, what’s not to like? There isn’t another soundbar at this price point that comes anywhere close. Unfortunately, an impressive spec sheet doesn’t automatically equal a great-sounding audio system. The whole can be less than the sum of its parts. Onkyo has a long reputation for delivering more for less,but it’s just not the case this time around. If you’re on a quest for the cinema experience at home, the Onkyo SBT-A500 isn’t the soundbar you’re looking for. Onkyo's STB-A500 soundbar packs loads of high-tech features, but it really misses the mark on audio quality.